FEBRUARY 4, 2019 - At Cambridge Rindge and Latin School (CRLS) in Cambridge, Mass., students flood into the international student center after the bell rings, marking the end of the school day. SOURCE: Pew Research CenterKaren Norris/StaffOne of them is Nafis Rahman, a high school senior from Bangladesh who arrived in the United States in 2016. After spending his first year in classes specifically for English-language learners, he’s now able to take courses with the mainstream students at CRLS. His favorite: Advanced Placement Computer Science. 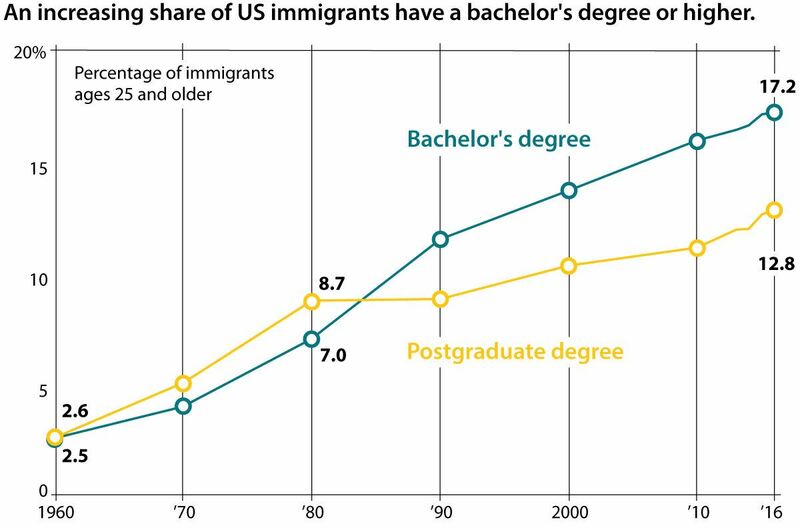 While immigrants from South and East Asia are most likely to hold a bachelor’s degree, and college graduates from those groups are more likely to remain in the US to work, educational attainment is rising among all ethnicities and origin countries. For example, the number of Mexican immigrants 25 and older with a high school diploma has more than doubled since 1980 – from 11.4 to 25.2 percent. The Cabrillo Advancement Program (CAP) supports low-income students – primarily immigrants and first-generation Americans – in California’s Santa Cruz County. The Cabrillo College program accepts students in sixth grade and mentors them for the next six years, along with guaranteeing them a scholarship at Cabrillo College. The program looks to address two potential hurdles: Mindsets that may discourage students from pursuing higher education, and resource gaps that may prevent them from doing so. Catherine Cooper, a psychology professor at University of California, Santa Cruz and the director of the Bridging Multiple Worlds Alliance, has worked with CAP’s coordinator and leader Elizabeth Dominguez to study the resources – or capital – that immigrant and first-generation students can leverage to succeed. Many students have family support and their own dreams to push them forward. In the program, they learn skills – like leadership – that can help them turn those dreams into reality. “The whole idea of navigational capital is what we teach in our summer [leadership] institute, which is, how can you navigate the bureaucracy and find out how to get that scholarship, or … can we get a fee waiver to take the SAT?” Dr. Cooper explains. Programs like Enroot and CAP can help immigrant students feel more confident. Deborah Midy, a junior at CRLS from Haiti, has visited colleges with her mentor and discussed the future over coffee. Like Nafis, she started with classes for English-language learners but is now taking honors classes with other students. In college, she wants to study architecture. She credits the English classes for preparing her, particularly because of a good teacher.